Well it’s almost show time! The regular season is behind us and now it’s time to see see which wrestlers are going to punch their tickets to Albany for the state championships! Let’s take a look at the Division 1 tournament….below is a weight class by weight class break down of what we could expect to see on Friday and Saturday at Monroe Woodbury HS. The favorite here has to be Saugerties senior Colby Amell. Amell missed all of last season due to an injury however he was the champion at this weight class in 2017. Amell’s only loss on the mat this year was at ESC to Kevin Lopez from Long Beach. The other two blemishes on his record this year were from an injury default and a DQ. He also has a very impressive pin over one of the other favorites at 99, Andrew Marchese from Washingtonville. 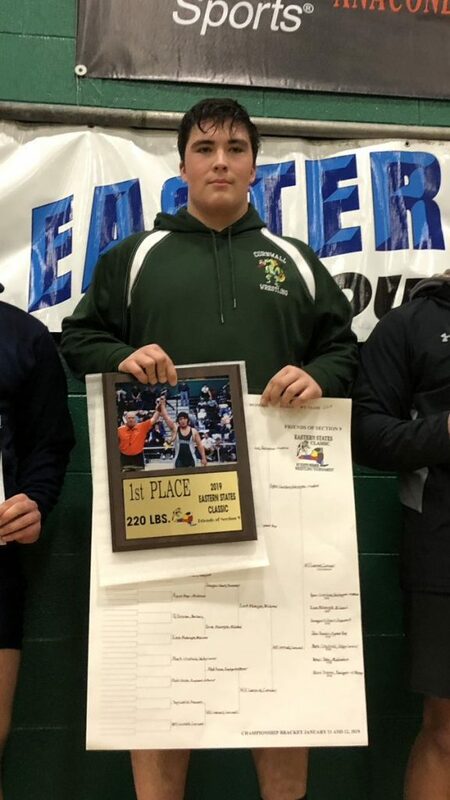 Marchese placed 5th in Section 9 at this weight last year is having a great 2018-2019 campaign with wins over a few others to keep an eye on here including Nicolo Ricciuto from Valley Central and Riccie Toldedo from Monroe Woodbury. While wrestling at 106 earlier this season, Marchese also notched a win over last year’s 99 pound champ Justin Morales from Middletown. Another 99 pounder to keep an eye on this season is Jackson Merli from NFA. Merli has over 40 wins this season including victories over Toledo from MW and Ricciuto from VC! Warwick’s Alex Greco, Minisink Valley’s Luke Greiner, and Cornwall’s Kevin Rourke will also be in medal contention at 99 pounds this weekend! Prior to Monday’s MV vs Middletown match, it was tough to make a compelling case for anyone else at 106 other than Zack Ryder. The Minisink Valley 7th grader is having an incredible season. He has 37-3 record and his only losses have come to last year’s NYS finalists at 99, Stevo Poulin from Shenendehowa (2X) and Chase Liardi from Massapequa. Ryder had pinned every single Section 9 opponent in the first period – all but one have been in the first minute! This all changed however on Monday night at MV! Ryder had his hands full with last year’s S9 champ at 99 pounds Justin Morales from Middletown. Ryder won the match 1-0 with the only point scored came via escape given to Ryder by Morales to start the 3rd period. All eyes will be on a rematch of these two on Saturday night in Monroe! One of the other wrestlers to watch here is NFA sophomore Jaden Hansen who is improving each week and has a recent win over MW’s Dylan Winters who should also place here. Hansen has only one loss to a wrestler in the field, Ryder from MV. Kingston’s Jacob Chenier has established himself as the favorite to take home the title at 113 this year. Chenier, who placed 3rd in S9 @ 106 last season, has only two losses this season – both coming at the Eastern States Classic. The Kingston junior has wins over most of the other contenders in this bracket including second seeded Elliot Crocco from New Paltz and third seeded Joe Habert from Minisink Valley. Crocco finished third in S9 D2 last year and is having a great season. Habert is a tough wrestler who knows how to finish. He recently pinned 2X S9 D2 champion Nikko Walsh at the Gene Brigham tournament. Austin Maddox from Washingtonville is having a solid season and will definitely contend here as will Alex Greco from Warwick, Andrew Filip from Minisink Valley, Andrew Davis from Wallkill, and Santos Ocasio from Monroe Woodbury. Whenever there is a 2X NYS placewinner in a weight class there is a very good chance that they are the favorite! Well Monroe Woodbury senior Marco Vespa finished 4th in the state in 2017 and 3rd last season. He is undefeated this season and is one of the favorites to finish on the top step of the medal stand in Albany in a few weeks! Standing in his way is Minisink Valley junior Nick Picariello. Picariello finished 3rd in Section 9 as a freshman and was a finalist last season. He’s having a great season and is very battle tested this year. We can also expect Moises Diaz from Middletown, Joe Ferro from Kingston, Jack Kohrs from MW, and Chris Zappolo from Washingtonville to contend for medals here! With several talented wrestlers in the hunt for the top spot on the podium, this will be one of the most closely watched weight classes in the tournament! Jordan Suarez from Minisink Valley is the top seed. He is a 2X Section 9 finalist and is having an outstanding season. Suarez has notched victories by pin over a few of the other contenders in this weight including Brandon DeLaRosa from NFA and Ryan Burgos from Monroe Woodbury, both of whom are having great years! The one wrestler Suarez has not faced is Pine Bush’s Kevin Urena who has a pin over Burgos this season and has also recently defeated state qualifier CJ McMonegal from North Rockland. DeLaRosa recently defeated Urena 4-3 at the NFA vs Pine Bush dual meet. Julian Rodriguez from Middletown, Travis Phillips from Valley Central, Eli Weinstein from Goshen, and Gavin Richter from Kingston will also be in the medal hunt. This is going to be another great weight class to follow but all signs are pointing towards a finals showdown between last year’s 126 pound champion Matt Romano from Valley Central and Tommy Maddox from Washingtonville. Maddox has been battling injuries all season but has still managed to put together a solid season including an 8-5 win over Romano during the Section 9 Duals. Maddox also has a win over D2 champ Matt Malherio from Highland and he made it to the quarters at the ESC before being forced to injury default out of the tournament. Romano is 1-1 against Malherio and has a win over former D2 champ Pat Ross from Onteora. There are at least 3 other wrestlers we need to watch here including Luke Fischer from NFA, Aiden Cuppett from New Paltz, and Joshua Sam from Middletown. This weight class could provide us with one of the more anticipated finals of the tournament in Savacool vs Palanca! Sean Savacool from Minisink Valley is having a great year including a 7th place finish at the Eastern States Classic. 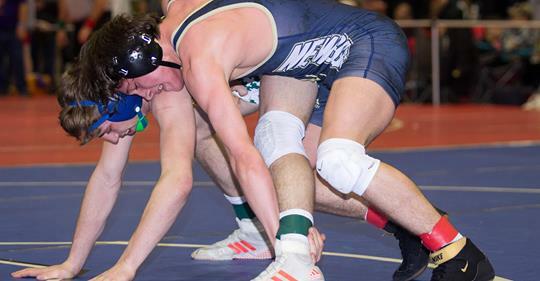 He has only lost to two NYS wrestlers this season and both of those wrestlers are favored to win their sectional tournaments – Tyler Albis (Section 1) and Mike Blando (Section 8). Ethan Palanca from New Paltz was the D2 champ at 120 pounds last year and is having a great year this season in D1! He has 6 losses this season and all are to top quality opponents. James Heinlein from Saugerties is the 3rd seed here and he’s a pinner! The other wrestlers to keep an eye on at 138 are Rob Estevez from Monroe Woodbury, Jeremy Jenkins from Middletown, Logan Schmalfuhs from Warwick, and Alex Burns from Cornwall! There are several very solid wrestlers at 145 but more than likely we will see a finals showdown between returning Section 9 finalists. 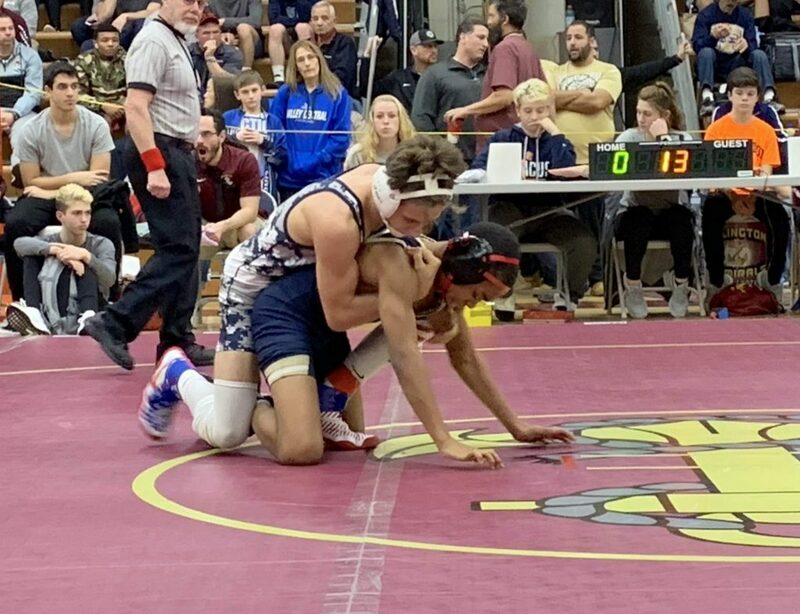 Tommy Askey from Pine Bush was the S9 D1 finalists at 132 last year and he is having a stellar 2018-2019 season. He is as tough as they come. In other corner we will likely see Nick Albornoz from Minisink Valley. Albornoz was a finalist at this same weight last year and he’s also having a great season! This match could be worth the price of admission! 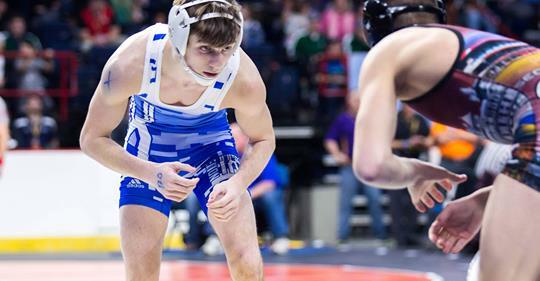 A few others to keep an eye on at 145 are Rob Giumarra from Cornwall, Myles Gordon from Kingston, Levi Wyns from New Paltz, and Jacob Lyle from Wallkill! Monroe Woodbury junior Joe McGinty is the definite favorite at 152 pounds in this year’s tournament. McGinty finished 2nd at 138 last year and 3rd at 120 as a freshman. He’s having a great year including wins over state medal caliber wrestlers Brock Delsignore from Shenedehowa and Steven Major from Kings Park. McGinty’s stiffest competition will likely come from Pine Bush’s Nick Florin. Florin, who also has a win over Steven Major at ESC, is having a great season and is looking to finish his high school career on top. McGinty defeated Florin 5-2 in the MW vs PB dual meet. This weight has some depth too! Wrestlers like Dan Heffner from Cornwall, Vincent Gennaro from Washingtonville, Logan Michael from New Paltz, Kraig Thomas from Wallkill, and Jeremy Mazzella from Warwick will all contend for medals. This weight class has the potential to set us up for a very entertaining finals pitting a senior versus an 8th grader – something we rarely see at a weight class this high! Steven Gazzillo, a senior from Cornwall, is the top seed and he is having a great season which includes an 8th place finish at the ESC. All 5 of Gazzillo’s losses have been to hammers; however one of his closest wins this year has been to Minisink Valley 8th grader Ethan Gallo who he defeated 6-2 earlier this season. Gallo is young, athletic, and getting better every day. A Gazzillo vs Gallo rematch could be one of the highlights of the tournament. In order for this to happen, however, Gallo is going to need to get past Middletown junior Joe Velazquez! Velazquez defeated Gallo 7-6 in the MV vs Middletown dual meet on Monday! Let’s not forget about some of the other wrestlers at 160 including Middletown’s Destin Morano, Monticello’s Doug Doherty, Wallkill’s Alden Hathaway. Pine Bush’s Lucas Pennell, and NFA’s Connor Leggett! There are definitely a few contenders at 170 but the favorite here is probably Matt Bucci from Saugerties. Bucci is having a very solid season and has wins over several of the top contenders in this weight class including Pasquale Satriano from Valley Central and William Noteboom from Warwick! Bucci placed 3rd at last year’s tournament and Noteboom finished 5th. Satriano missed last year due to injury and is looking to cap off his high school career with a S9 title! A few others to keep an eye on at 170 include Nick Patterson from NFA, Gabe Gutierrez from Pine Bush, and Justin Lyle from Wallkill. One of the surprises of the of the post season has been the decision of returning Section 9 champion Tyler Serafini from NFA to enter the post season at 182 rather than 170! Serafini won at 152 last season and is looking to finish his career on the medal stand in Albany. His top competition in S9 will come from Cornwall’s Luke Wojehowski and Middletown’s Elijah Babb. This weight class has some solid depth too! Wrestlers like Joe Russell from NFA, Scott Geysen from Minisink Valley, Mike Paravati from Monroe Woodbury, Zavier Bennet from Kingston, and Mike Cassidy from Cornwall are all looking to place here! Top seeded Sam Santander from Monroe Woodbury was the Section 9 D1 champ at 195 last season and he’s looking to make a return trip to Albany! Santander is having a great year and is a great finisher…this year he is hoping to place at the state tournament! The surprise second seed at 195 is Minisink Valley sophomore Carson Henry! Henry missed all of last season and is having a very good 2018-2019 campaign as is third seeded Hayden Barley from Kingston. MV’s second entry here is Tyler Castro and he is the forth seed. Cornwall also has two solid entries here in Colin Cassidy and Joshua Keller. All that can be said is “WOW!” This weight class boasts two returning state place winners and promises to provide us with a classic final match up if the seeds hold true! The #1 seed is Cornwall’s Will Leonard. Leonard placed 6th in NYS last season and last month he became Section 9’s first ESC champion in 5 years! The #2 seed is NFA’s Maxx DeCapua. DeCapua placed at the states last season and the ESC this season – at 195! He has decided to bump up to 220 and challenge Leonard in what will potentially be the match of the night! And this by no means is a two horse race! Other contenders at 220 include Valley Central’s Mark Crisfield who was a finalist at 220 last season and Middletown’s Armel Duke who is having a great season! Let’s not forget about 5th seed Devin Dixon from New Paltz who was the D2 champ at 220 last season! Last year’s Michael DeCapua Award for the most exciting match of the Section 9 finals was awarded to Fenner and Havison at 285. This may happen again,but this year it could be Adam (not Andrew) Fenner and Preston Havison. Fenner, a sophomore at Minisink Valley, and Havison, a Monroe Woodbury senior, have already met three times this season. Havison pinned Fenner in their first meeting up at the Wrangle on the Plains but Fenner has won the last two meetings via 6-0 and 4-0 decisions! There are others in the hunt here as well! VC’s Bryce Moore and NFA’s Caleb Williams are both dangerout and we would be remiss if we didn’t mention the Middletown 7th grader Stephan Monchery. The 285 weight class has provided S9 wrestling fans with plenty of excitement over the past few season and this weekend will be no different! My name is Colin Cassidy, NOT Collin! Great preview, Mike. Section 9 is very lucky to have you!